In nuclear physics and nuclear chemistry, the various species of atoms whose nuclei contain particular numbers of protons and neutrons are called nuclides. 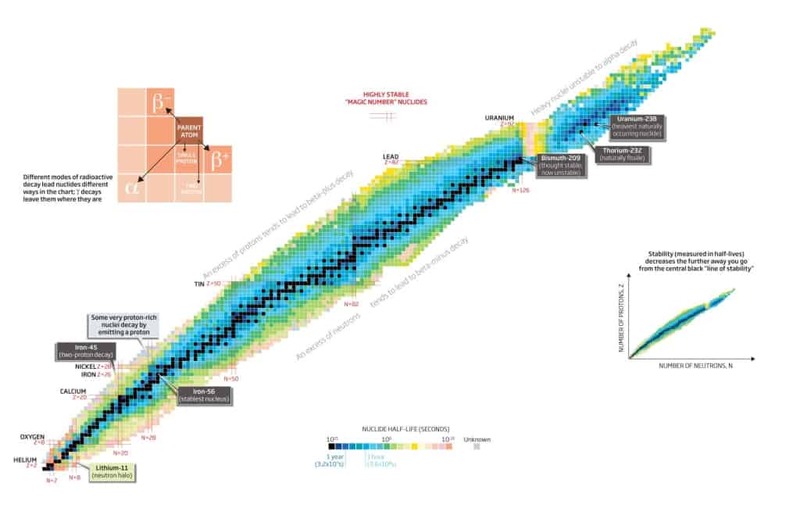 Nuclides are also characterized by its nuclear energy states (e.g. metastable nuclide 242mAm). Each nuclide is denoted by chemical symbol of the element (this specifies Z) with the atomic mass number as superscript. Isotopes are nuclides that have the same atomic number and are therefore the same element, but differ in the number of neutrons. Hydrogen (H), for example , consist of one electron and one proton. 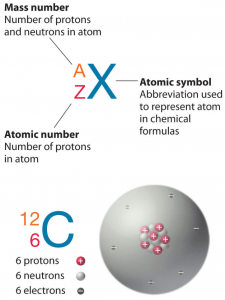 The number of neutrons in a nucleus is known as the neutron number and is given the symbol N. The total number of nucleons, that is, protons and neutrons in a nucleus, is equal to Z + N = A, where A is called the atomic mass number. Thus the symbol 1H refers to the nuclide of hydrogen with a single proton as nucleus. 2H is the hydrogen nuclide with a neutron as well as a proton in the nucleus (2H is also called deuterium or heavy hydrogen). Atoms such as 1H, 2H whose nuclei contain the same number of protons but different number of neutrons (different A) are isotopes. Uranium, for instance, has three isotopes occurring in nature – 238U, 235U and 234U. All have 92 protons in their nuclei. But, whereas the 235U isotope has 143 neutrons in its nucleus, that of the 238U isotope contains 146 neutrons. The stable isotopes (plus a few of the unstable isotopes) are the atoms that are found in the naturally occurring elements in nature. However, they are not found in equal amounts. Some isotopes of a given element are more abundant than others. For example 99,27% of naturally occuring uranium atoms are the isotope 238U, 0,72% are the isotope 235U and 0,0055% are the isotope 234U. Because all the isotopes of a given element exhibit the same chemical properties, their separation is very difficult by chemical means. The traditional methods of isotope separation are based directly on the atomic weight of the isotope or based on the small differences in chemical reaction rates produced by different atomic weights. These methods have included mass spectometry, centrifugal separation and processes that depend on the different rates at which heavy and light particles diffuse.